The great sport of track and field dates back as far as 776 BC when a simple footrace was the first and only event in the Olympic Games. For hundreds of years the sport consisted of predominately male competitors. In fact, it wasn’t until 1928 that women were allowed to compete in Olympic track and field (4). Since then, however, female participation in athletics has increased quite significantly. While it is a generally accepted fact that men tend to be faster, stronger, and essentially more athletic than their female counterparts, recent studies have shown that women are starting to close the gap in athletic ability. This theory most specifically applies to long distance running events, where a growing population of female marathoners and ultra marathoners seems to be getting faster every year. Research at Oxford University claims that by the 2156 Olympics, women will be competing at the same level as men, and that they may even be faster (1). But how could this be? We’ve all learned that high levels of the male hormone testosterone, faster metabolisms, and higher percentages of muscle in the body cause males to be generally quicker and stronger than females. Being lean and muscular is clearly advantageous in shorter races. However, as it turns out, in very long distance races (i.e. the marathon and beyond), the body’s main source of energy comes from fat. This is because after a few hours of running, carbohydrate stores (our primary energy source) are in short supply. Therefore, because women have higher percentages of body fat, they are better equipped for ultra marathon distances (2). To supplement this idea, one case study shows that when comparing individual males and females of similar speeds at shorter distances, the female will generally be faster at longer distances. This comparison is illustrated by the figure at the right (3). As a female athlete, I decided to put this theory to the test by comparing the top times of elite male and fem ale runners over distances ranging from the 100m dash to the marathon. Unfortunately, information on longer races was difficult to come by. Using the current 3 fastest times in the world for each event (source: 5), I calculated the percent difference between males and females, hoping to discover a decreased difference as the distance increased. This, however, was not the case, as the percent difference was roughly 11% for almost every event. My data is shown in the chart on the left. 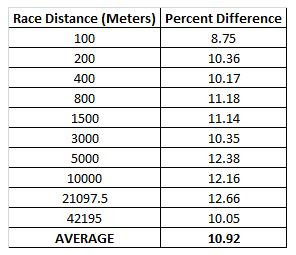 It is important to keep in mind that this data is only representative of distances less than or equal to 26.2 miles, where we would still expect men to be faster. There was a reasonably significant decrease in percent difference between the half marathon (21097.5 m) and the marathon (42195 m), spanning from 12.66% in the half marathon to 10.05% in the marathon. This is obviously not very reliable research, but it appears to be consistent with the other recent studies. Who knows? 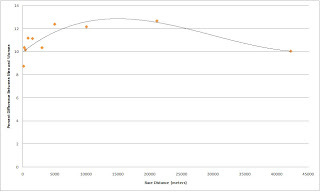 Had elite times for ultra marathons been more readily available, perhaps the trend line (displayed on my graph below) would have shown women catching up to men. For now, it is probably best to leave the research up to the scientists. This new theory could potentially be a breakthrough for female runners, specifically ones willing to race distances over a marathon. So embrace your abundant fat stores, ladies, they could make you stronger in the long run!